Little Willie Littlefield (2)Willie Littlefield was born in 1931 in El Campo, Texas. Seventeen years later he recorded his first record �Little Willie�s Boogie� with his school friend Don Wilkerson on saxophone for the small Houston based Eddies Label. Three more 78�s followed which led to a recording contract with the much larger Modern Corporation and relocation to Los Angeles. In the late 40�s/early 50�s the California scene was awash with black migrants from Texas all working and keen to party. Their music of choice was a combination of hard Texas blues with uptown cool. Charles Brown and Joe Liggins ruled the roost and Willie, with Don by his side, eased right alongside them. He was �hot to trot� and began a mammoth recording spree with Modern and later with Federal that lasted four years. A prolific songwriter and excellent boogie based pianist � his idols were Albert Ammonds and Pete Johnson � his recordings during this period are timeless examples of West Coast R&B. Stella accompanists Wilkerson, John Handy and Johnny Moore all ooze class. Ace Records in London have issued two superb CD�s 503 and 736 of this material which included his big hit �Its Midnight (No Place To Go)� and the classics �Drinking Hadacol� and �KC Loving� which Leiber and Stoller re-wrote as �Kansas City� for Wilbert Harrison. In 1957 Willie switched to Rhythm Records but Rock and Roll was coming and, despite some excellent tracks with the great Johnny Heartsman on guitar, Willie and the west coast sound were for yesterday�s people. Don Wilkerson had by now left to join Ray Charles� band and Willie chose to move to San Jose where he made a living playing local bars and clubs for a slowly ageing audience. No one called and the golden age was gone. 1n 1975 the Blues Connoisseur Label, ran by a blues enthusiast, recorded Willie and issued a couple of limited edition singles. These were reviewed in Blues Unlimited and the world woke up to �Willies Boogie� once more. He was booked into the fledgling San Francisco Blues Festival and Willie hit the road again. In 1980 Willie was asked to play for a French Jazz Festival and recorded for the Paris Record Label. More European dates quickly followed and two years later, whilst he was in Holland, he met a Dutch lady, fell in love and settled in the Netherlands. Years of concerts, festivals and seemingly endless recordings dates followed with Willie and his wife constantly travelling throughout Europe. He even managed the odd stop over in England including a 1985 trip for Ace Records which yielded the album �Happy Payday� and a packed Hammersmith Hall concert. Then around 1998 Willie announced his retirement and that, we thought, was that. In 2005 we began to pester Willie to come over to Castor for a Shakedown concert, without, initially, any sort of success. Then suddenly we received a call telling us that he was ready to roll and a few false dawns later we managed to actually set a date. 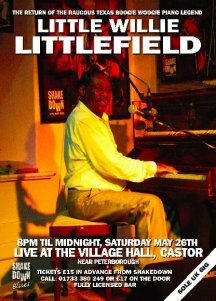 In May 2006 Willie flew in for an amazingly physical bout with the battered Castor Village Hall piano, which had been repaired, renovated and tuned especially for the event and one year later we were proud to announce that both Willie and the piano were fresh enough for a second round. As one of the last remaining practitioners of the old school boogie woogie and jump blues it was a great pleasure to present him on both occasions.